Bengaluru FC continued their impressive start to their U18 Youth League campaign with an impressive 5-0 win over Chennai City FC in a Round-3 encounter at the BFC Residential Academy Ground in Vidyanagar, on Tuesday. Having kept complete control of the game, Biswa Kr. Darjee broke the deadlock in the 11th minute before Lalrintluanga Chawnglut (30') and Lalrinfela (44’) made it 3-0 going into the break. Second half goals from Jacob John Kattookaren (75') and substitute Lalengzama Vangchhia (89') wrapped up the Blue Colts' third win on the trot. 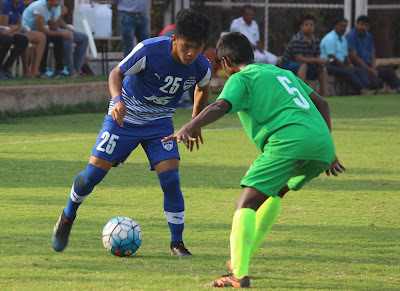 The result also took Bengaluru FC's tally to 9 points as they stay top of the Chennai-Karnataka zone.